Grow your favorite garden vegetables early in the season with help from these Gardeneer Season Starter Plant Insulators. These unique, durable protectors perfectly surround your young tomato, melon, or pepper plants at the beginning of the growing season, shielding them from freezing temperatures. Each of these 9 sheets has 18 preformed troughs, designed to be filled with water and then placed around each plant. The water not only helps these units rest on a level surface; it also absorbs the sun's heat during the day. As night falls and temperatures drop near freezing, the heat from the water escapes into the air, warming your plant and protecting it from the cold. This allows you to plant fruits or vegetables up to 6 weeks earlier, for a longer growing season and earlier harvest. Each sheet may be removed in moments when the danger of frost and freezing has passed, and the units fold flat for storage until the next season. The plastic body of them offers both versatility and durability, and their soft green tone meshes with your garden. Help your favorite vegetables and fruits thrive by surrounding them with these Season Starter Plant Insulators. Made in the USA. 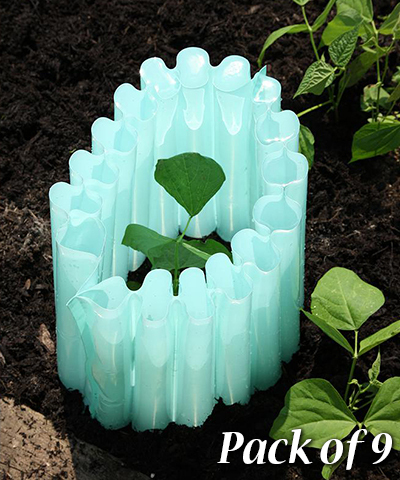 Note: This case pack includes 9 of the Gardeneer Season Starter Plant Insulators.